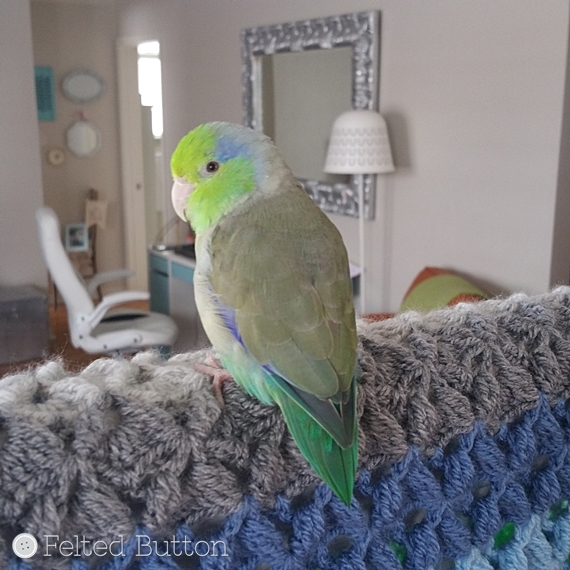 I've named it Parrotlet's Flight Blanket because the fabulous colors were inspired by my son's Pacific Parrotlet, Elend. Let me introduce you. This pretty little bird is sometimes called a Pocket Parrot. And believe me, he is a very BIG personality in a little bird body. He's clever and sweet and busy--and such a blessing to my son. But will you take a look at those colors! The middle of his back and edge of his wings are this intense royal blue, and the subtle variations of colors are so breathtaking! Look at that irridescent tail! I made this blanket with Scheepjes *Colour Crafter which is a fabulous go-to for projects like this because of the wonderful color selection (over 90) and the soft, washable and affordable premium acrylic. If you want to get the fabulous Scheepjes Colour Crafter yarn for this blanket, you can get your hooks in it from Wool Warehouse *here or Deramores *here. ~Complete materials list including the colors used in this blanket. (There are 11 colors--1 skein each color for the smaller crib-sized blanket shown here, and 2 skeins of each for the larger throw (which has 4 squares across the bottom). ~Stitch abbreviations (US terms), special stitches and notes sections. ~Photos and written portions of the join-as-you-go process for the squares to the blanket, as well as several photos for attaching the tassels. ~A placement diagram for positioning of the squares. I hope you like it as much as I do. Remember, if you are wanting to stay in the "Button Loop" the best places are on Facebook here, Pinterest here and Instagram (@Feltedbutton). Lots of color, new tips and tricks, free patterns and plenty of yarny talk going on around here!